Over the last decade, the existence of ‘food deserts’ has been a rising issue in the United States. Obesity and food insecurity have become front and center issues in policy debates as well. However, the term, ‘food desert’, has been abused or misunderstood by many people. 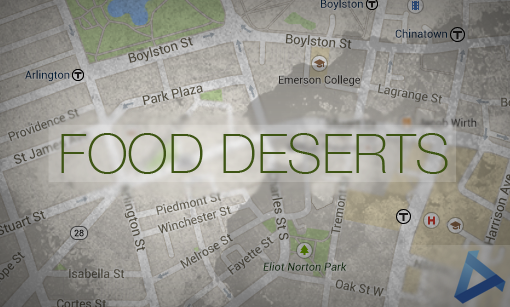 A food desert can be defined as a geographic cluster without a grocery store offering healthy food choices. This leads to low access to healthy food, which in turn provides less than adequate nutrition to individuals. Research presented by Mari Gallagher, Principal of the Mari Gallagher Research and Consulting Group, expresses how problematic food deserts are and what can be done in order to remedy them. Gallagher brings up how food and health are impacted heavily on location. In some areas the food choices one has are not really a choice because of accessibility to grocery stores. The phenomenon is overwhelmingly an issue in cities and for women and children. It is also important to understand that race is also a factor in this issue. Not having access to grocery stores is a threat to public health as studies show those who live in food deserts are more likely to suffer and die because of diet related problems. Gallagher also touches upon how the food stamp system is a leading cause of unhealthy food choices people make when on this program. A study conducted by her consulting group explains how food stamps are designed for buying unhealthy food options, possibly due to cost. So what can be done? Many solutions are common answers to this question including the creation of community gardens and farmers markets. While these are helpful, Gallagher poses an interesting solution. She believes access to data on food related measures is instrumental to reducing the number of food deserts. Gallagher proposes using the data to create priority sites of areas suffering due to food deserts. This would ensure grocery stores are being built where they are needed to give access to populations that are currently separated from healthy food stores. To go along with this idea, she explains how solutions are raising standards and enforcing them, along with motivating retailers. Targeting the information and the process of determining where to locate stores is important as it attacks the main problem of these grocery stores not being where they are needed. Farmers markets and community gardens have been helpful, but they shouldn’t be the only solution. Individuals living in cities should have the same access to a grocery store with healthy options as those living in the suburbs. Using data to pinpoint where stores are needed is more effective than guesses made for other reasons.